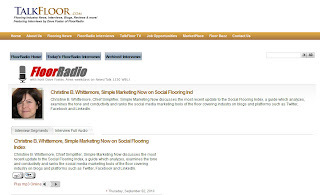 Christine B. Whittemore, Chief Simplifier, Simple Marketing Now discusses the most recent update to the Social Flooring Index, a guide which analyzes, examines the tone and conductivity and ranks the social media marketing tools of the floor covering industry on blogs and platforms such as Twitter, Facebook and LinkedIn. 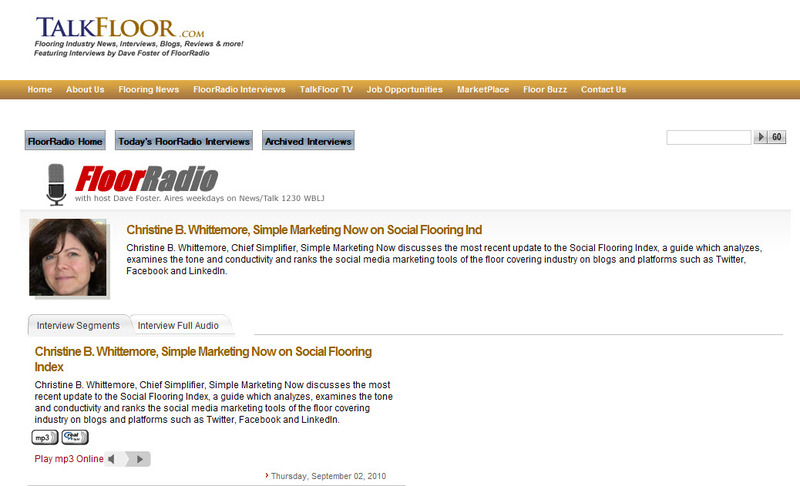 You can access the interview on the Social Flooring Index by clicking on this TalkFloor.com link. It lasts approximately 15 minutes. I find that time truly flies when I speak with Dave. Perhaps it's because he's such a good listener and allows me talk about subjects I'm passionate about. In any case, this interview was prompted by my recent Press Release: Social Flooring Index Tracks Flooring Social Media Conversations and allowed me to describe the benefits of Analyzing Social Media With eCairn Conversation. It was also a chance to talk about relevance online and creating value for our customers, to reinforce the points that are cropping up in our social media marketing interview series, and emphasize how critical it is to develop a sustainable social media and content marketing strategy. This stuff takes effort and commitment and better to think through all of the implications of your online activities so they truly support your business strategy. I also got a chance to talk about BuildDirect's Rob Banks being featured on Mashable for his use of online video! Thank you, Dave Foster, for another wonderful conversation! Sewa mobil, you are welcome! Thanks for stopping by.